World Sailing has 117 affiliated class associations and the World Sailing Classes Committee is an opportunity for the representatives to have their voice head and discuss decisions that impact their specific class. Twenty-five individuals attended representing upwards of 35 class associations with delegates representing classes such as the Optimist, 12 metre, the Olympic classes and numerous keelboats, dinghies and boards. Safety in the sport was also discussed, notably the importance of ensuring personal safety measures and categorising of the classes based on risk. The past 12-months has been a busy one for Youth sailing events with the 2017 and 2018 editions of the Youth Sailing World Championships taking place in Sanya, China and Corpus Christi, USA. The Youth Worlds continues to grow and the Sub-committee received reports on both events. Both were viewed as a success but Corpus Christi raised the bar for delivering an outstanding sustainability initiative as well as delivering outstanding sailing conditions. Elizabeth Kratzig, Co-Chairman of the Green Team at the 2018 Youth Worlds, was on hand to deliver a report on the sustainability initiatives. The event was supported by 11th Hour Racing and was a first for World Sailing and focused on ocean conservation and sustainability. 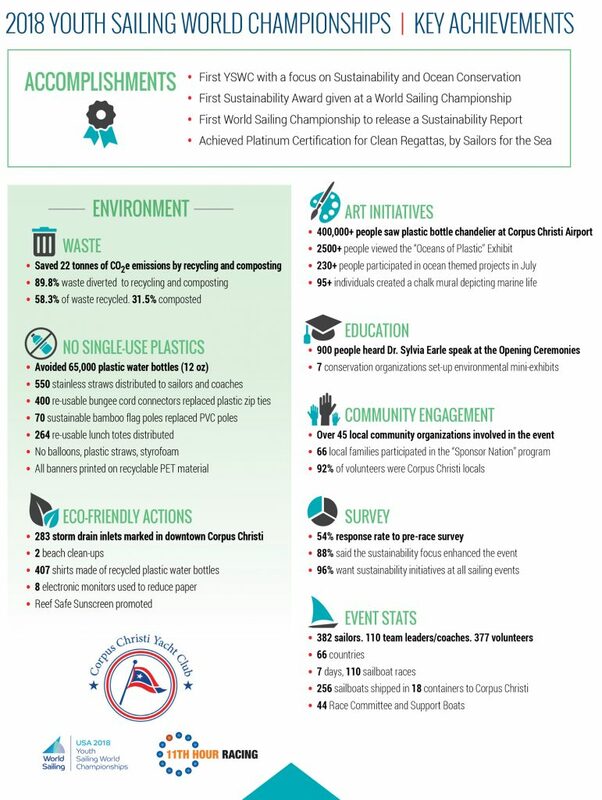 The event avoided using 65,000 plastic water bottles (12 oz), saved 22 tonnes of CO2 emissions by recycling and composting and exposed 400,000 people to the event with a plastic bottle chandelier at Corpus Christi airport. A full report will be posted on the 11th Hour Racing on Monday 29 October but headline information can be found here - http://11thhourracing.org/wp-content/uploads/2018/04/key-achievements-print-771x1024.jpg. The Sub-committee enjoyed a good debate on the future strategy of the event as well as safety at youth events. The Sub-committees are comprised of leading international officials that govern the sport at worldwide events. Throughout the day the Sub-committees discussed a variety of topics, focusing on education and training of officials and the work completed over the last 12-months. They also looked ahead to 2019 and the continuous delivery of clinics to deliver fair competition worldwide. In a closed session, the Sub-committees discussed race official applications, reviewing renewals and new applicants. A final decision will be made by the Race Officials Committee on Tuesday with appointments announced as soon as possible on Wednesday.